The Pettibon System is a proven spine and posture correction methodology that, along with providing pain relief, restores normal spinal form and function. You play an integral role in this correction by personally strengthening the weak areas that initially allowed your condition to develop. We offer a complete rehabilitation program that works toward ensuring permanent correction. Why is Pettibon different? Patients actively participate in their care both in the clinic and at home! When patients come to the clinic, they won’t sit passively waiting to see the doctor. They prepare for their examination by doing warmup exercises and stretching their muscles, ligaments, and discs using the Therapeutic Wobble Chair and the Repetitive Cervical Traction unit. It isn’t enough to merely have a massage or a heating pad on your back prior to the adjustment. These are superficial. Warm up exercises actually hydrate the disc and increase disc height. This prepares the spine for a treatment that will have staying power. With The Pettibon System, strengthening postural muscles and building endurance is an ongoing process. To accomplish this goal, patients use various pieces of equipment in the clinic and special rehabilitation equipment twice daily at home. 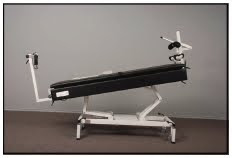 How does The Pettibon System re-align the spine so that it can function optimally in its upright position relative to gravity with the patented Pettibon Weighting System? The Pettibon Weighting System consists of specially designed head, shoulder and hip weights that patients wear twice daily for up to 20 minutes, based on their treatment plan. The amount of weight and its placement depends upon the spinal misalignment that needs correcting. The Pettibon evaluation starts with a physical examination and an x-ray examination. Up to seven views of the spine may be taken, more if necessary. X-rays are also used in impairment ratings and 'tests' to determine if and how patients will respond to care. Why? Abnormal spinal form can’t be detected on x-rays until the soft tissues fail. When the soft tissues are no longer are able to hold the hard tissues (vertebrae) together, erect and aligned with gravity, the spine buckles into its injured position. When we go from a standing to a sitting position, we increase interdiscal pressure by 30%. When we go from lying down to sitting, the pressure is increased by 50%. So Pettibon x-rays are taken seated to increase stress in the spinal para-vertebral soft tissue. Having patients seated for x-rays also eliminates the influence of unequal contraction from the legs' muscles that attach to the spine. The accepted cumulative dose of ionizing radiation during pregnancy is 5 rads; the most sensitive time is between 10 and 17 weeks. Two routine chest x-rays = .00007 rad. Radiation to the fetus shouldn't exceed 10,000 millirads. Annual environmental radiation is 300 millirads/year which equals 12 chest x-rays. The Pettibon X-ray Series (7 views) = 20 millirads. To exceed 10,000 millirads would take 3,124 x-rays. Prospective patients aren’t automatically accepted for care. Atlanta Spine and Wellness doctors need to determine ‘if’ and ‘how’ prospective patients will respond to care. And this requires testing. In one test, prospective patients will wear Pettibon System Weights and have their lateral cervical spine re-x-rayed. Other tests evaluate whether prospective patients’ postural muscles are strong enough for the corrective procedures. Typically, as high as 40% lack the strength and endurance they need. So they will be required to go through a rehabilitation program to strengthen their postural muscles before going on to spinal correction. Patients actively participate in their care—both at the clinic and at home. When patients come to the clinic, they don’t sit passively waiting to see the doctor. 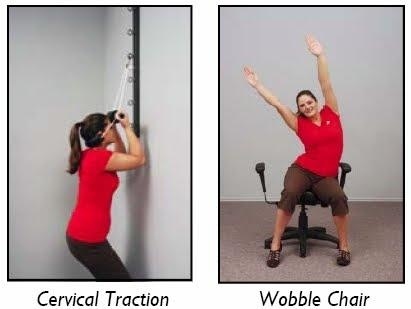 They prepare for their examination by doing warm up exercises and stretching their muscles, ligaments and discs using the Wobble Chair and the Repetitive Cervical Traction.